My dog has a “hot spot”. What is it and how did he get it?! Hot Spots are Itchy, sticky, gooey and red. 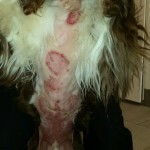 With the summer months upon us there’s a chance you may notice something like this on your dog. There’s nothing pleasant about hot spots. 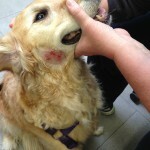 They are unsightly patches of infection that pop up on dogs seemingly overnight. 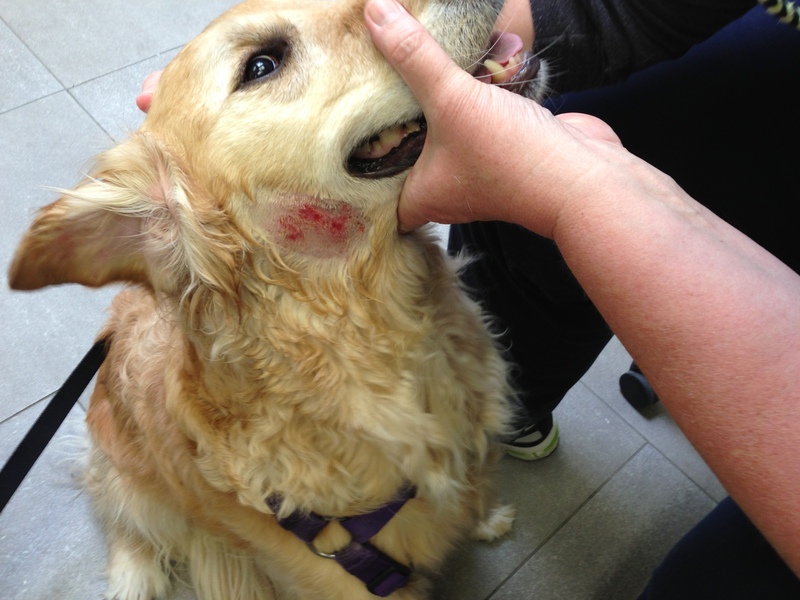 Pyotraumatic dermatitis, the medical term for hot spots, arises when a dog starts to chew at his or her own skin excessively. Hot spots can develop very rapidly, going from a tiny, itchy spot to a large, angry lesion in a matter of hours. Left untreated, these superficial infections can develop into a deeper skin infection that can requires more substantial treatment. Some hot spots will respond to topical treatment. The key is to remove the fur that’s trapping moisture and debris on the skin and to keep the skin dry during the healing process. 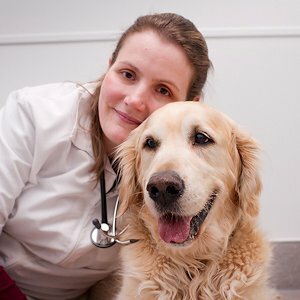 Your veterinarian can prescribe a product that is safe and effective, usually a combination of antibiotic and steroid. 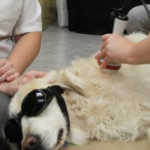 Royal York Animal Hospital employs laser therapy that can speed up healing times and can return your pet to comfort in a shorter period of time. If the infection has progressed into the deeper layers of skin, topical medications are not enough we will need to prescribe oral/systemic medications. 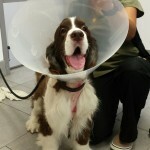 Oral antibiotics and steroids can quickly clear up those painful spots, but be prepared, your veterinarian will likely recommend your dog wear one of those lamp shade collars (elizabethan collars-aka the cone of shame) to keep him or her away and let the area heal. The hotspot needs to be kept clean and dry to heal properly so your pet won’t be able to go swimming for about 14 days. Although unpleasant and uncomfortable, hot spots are among the easier skin conditions to treat. 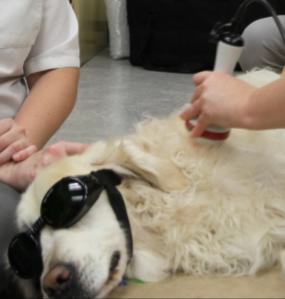 With early detection and treatment, your dog will be on the mend in no time. 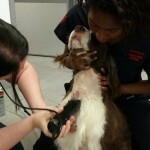 Below are photos of Angus, a 10 year old English Springer Spaniel, who was recently treated at Royal York Animal Hospital for a particularly severe hot spot that covered all of his chest and belly. Our technicians shaved and cleaned the area to make him more comfortable. Angus all decked out with his head collar ready to go home — and feeling a lot more comfortable and a lot less itchy ! Angus After completely shaving and treating the affected area, you can see how large this hot spot actually was. Poor Angus! Angus Here you can see RYAH Technicians start to shave the hot spot which at first appears to be fairly localized.